removing sources of heat from within the house. there is little vegetation directly around the house. In the jungle hostel that I helped to run at a Permaculture Farm in Costa Rica (2005-2006), this was the direct opposite with vegetation all around and even creeping into the house a bit. It was nice to see the toucans literally a few feet away on the back porch but the jungle overgrowth held too much humidity and decreased air flow. 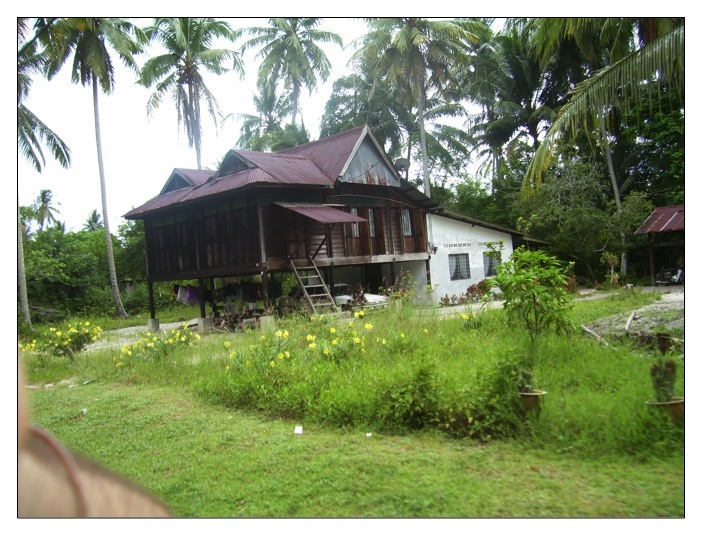 What Mollison does advocate in terms of vegetation is exactly what you see below with the palms trees occupying the canopy space to deliver some shade to the roof but far away from the house where there is no immediate danger of falling coconuts. This allows cross ventilation breezes to flow with no impediment. Vegetation near the house can help in one aspect which is by creating a shade house on one side of the house to create a cooler temperature concentration through trellising vines. This will create air flow through temperature difference especially when combined with letting out the heat through elevated vents. Using vents in the ceilings or top of the house moves air since the hotter air will rise and then can escape freely. In the picture below the small triangles at the top front do exactly this. The windows in this house below as have screens on the window which does keep insects and critters away. They are often fitted with shutters to be closed in an intense storm situation. 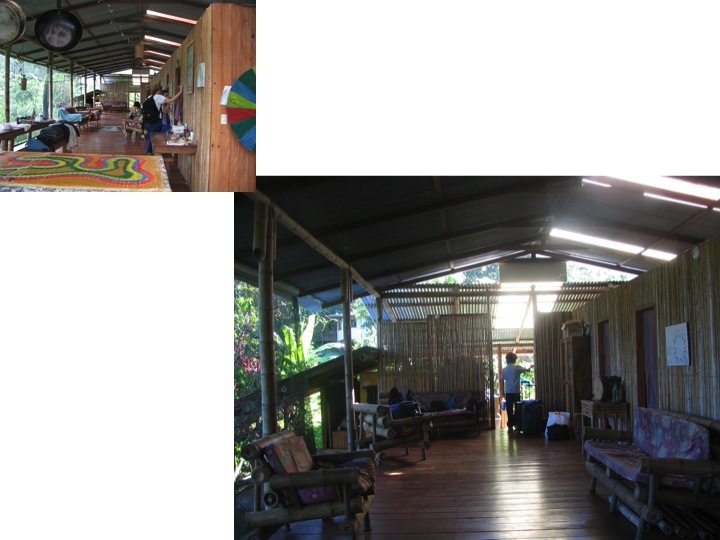 The picture below is another structure from the farm I worked at in Costa Rica that served as a guest house. It was called the bamboo house as the interior walls were made of bamboo. Mollison also advocates the use of light materials in interior walls to reduce heat build up and keep the structure light. Like the top picture which the structure was made out of Casuarina, we had to be diligent in looking for termites crawling up and cycling carbon which is not what you want from a house. In the design and build phase, it is imperative to make sure these materials are not in contact with the ground. Bamboo is fantastic building material but is not at all ground durable and does attract termites if not properly cured. Thus it was built up off the ground and used concrete footers where the top picture of the thatch roof building in India used the tradition of long, rough carved, granite pillars for stilts. Like anywhere else, tropical houses have inputs and outputs. One input is electricity, which is often sporadic in tropical nations so it can help to be off the grid. One of the best forms of an appropriate technology there and usage of electricity, in my opinion, is a fan. Even with the best design of cross ventilation and other strategies discussed, a fan can go a long way to help keeps molds away and air circulating. Moreover, on the slide below the two right pictures were the domestic electricity supply through solar and the garden water supply. 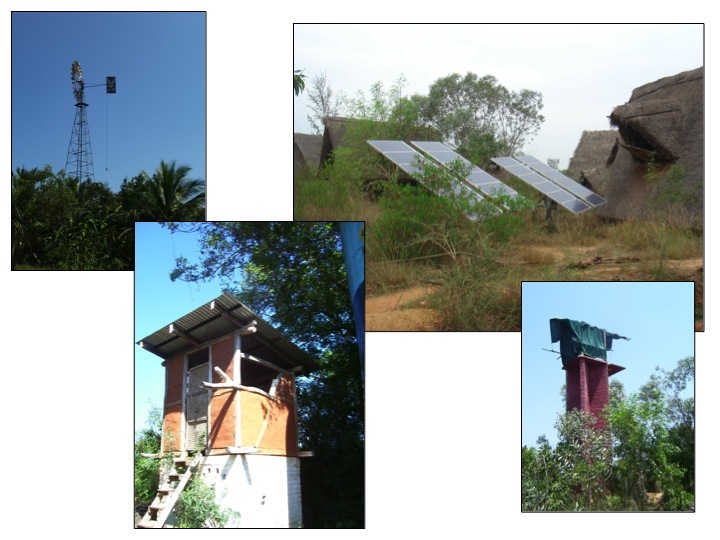 Because huge arrays are not always economically feasible with their associated batteries, this project in South India (Sadhana Forest) where I taught a PDC in 2009, created a battery pack for the water through an elevated water tank thus enacting the principle of energy cycling. This would allow us to water the garden very early in the morning as the sun was rising each day without using the pump in that moment. Thus we were using gravity as the energy stored with the water held in this elevated position. Another wonderful appropriate technology in the tropics is the compost toilet. Because sanitation can be poor there and microbes thrive so intensely, the use of concrete is applicable in the chamber part to deal with the heat, humidity, and possible flooding. It is concrete, I know, but I do feel its an appropriate choice especially after one project I was at in the tropics and felt like sanitation was poor and sickness swept through our project rapidly. This was in part because the chamber was sunken and not a great design. The concrete or plastic, but harder to come by often, container allows the chamber to be elevated and no risk of groundwater contamination. It’s easier to clean out and composted properly from there. Other housing considerations include domestic water supply so on the slide below top right, I have included an appropriate technology that I saw quite a bit in India which was using a windmill to power a water pump. This would lift groundwater again to an elevated tank where it could be gravity fed when needed and rely on biological resources to meet needs. Another housing concern of Mollison’s for the tropics that he addresses is the use of outdoor kitchens. Cooking can really heat up a house and make life uncomfortable inside the house because of heat but also smoke. Lots of people in the tropics are still cooking with rudimentary stoves inside the house and women in particular suffer the consequences of poor fire combustion and the noxious smoke that is delivered afterwards inside the house. Thus the research and development and subsequent avocation of the use of rocket stoves by the Aprovecho team from Oregon is addressing this exact need. This technology allows for more efficient burns creating much less smoke and also very importantly using less fuel. Because deforestation is rampant from relying on this fuel resource instead of a gas bottle or electricity like in the more northern countries of the world, rocket stoves and other appropriate technologies can have a positive cascading effect to the landscape around including water and soil fertility. It is often nitrogen-fixing trees that are cut as they burn hot and grow fast. Keeping these trees from being cut so frequently can spell the difference between the flood and drought syndrome that produces famine and instability. Thus the pictures below shows fallen trees from a cyclone in India knocking down invasive acacias and supplying our fuel cooking needs. 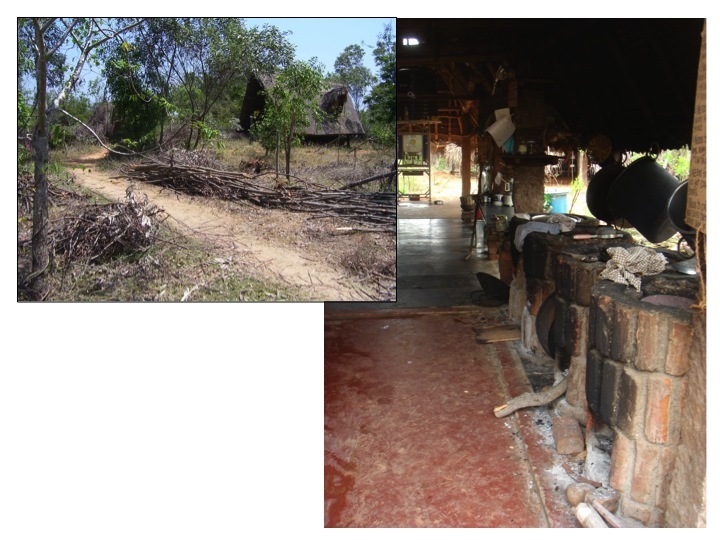 So this problem of an “invasive” tree became the solution for our cooking needs which we leveraged with the rocket stove design seen on the right below to make it efficient and cook for over 100 people a day. It was housed in its own outdoor kitchen space which could be applied to individual houses. Rocket stoves are not the only option for cooking in the tropics as many are trying to break down this cultural conditioning of cooking with wood and get people to also utilize the power of the sun. Many NGO’s are doing such work and some friends of mine from my hometown of Cincinnati, Ohio, USA are working with the U.N. to help spread their technology (GoSun). They have had good success at bringing their stoves into villages in Guatemala and are expanding such work to other places. Outputs of the house include greywater and food wastes. Both can go to the same location which is a wonderful design feature known as the banana circle. By combining the two, heaps of organic matter will be cycled very quickly into food and biomass producing plants. They are located not too far from the house in zone 1 usually as to reduce the costs of piping. A channel could lead from an outlet behind the house, which is commonly seen in the tropics, to the banan circle. Seen in the slides below, as well as banana circle schematics, are a list of plants we used in the humid tropics for greywater. These can also produce food and biomass and are a drastic improvement of just the pipe leading out of the back of the house. These are just a few examples of how building with good design are met by the advantages of utilizing appropriate technology and matching inputs and outputs. Mollison, B. & Slay, R.M. (1991) Introduction to permaculture. 2nd Edition. Sisters Creek, Tasmania, Australia. Tagari. Hello, am very interested in how your project is turning out. Just acquired a small property near Guapiles and am hoping to achieve something similar. But find it hard to find good information from local folks. Everyone seems to preach the glories of cement, pesticides, crops suited for cooler, less humid climes, etc. Any tips would be most helpful. Thank you. I am planning to build a tiny jungle shack on the warm, very humid Caribbean side of Costa Rica. I see many tips about the wonderful supposed benefits of concrete in terms of “thermal mass.” But I do believe that you are very right that concrete would make the shack very humid. And that wood (hopefully termite- and polilla-resistant) would be a airier and better choice. Unfortunately, looks like it will have to be a zinc roof as thatch is hard to find, suggesting that the trees may be endangered. Will use white roof paint, which I have NEVER seen on a house in Costa Rica and is very more expensive than traditional green or red, but well worth it, I hope.